The Venerable Bede composed On the Nature of Things (De natura rerum) and On Times (De temporibus) at the outset of his career, about AD 703. Bede fashioned himself as a teacher to his people and his age, and these two short works show him selecting, editing, and clarifying a mass of difficult and sometimes dangerous material. He insisted that his reader understand the mathematical and physical basis of time, and though he was dependent on his textual sources, he also included observations of his own. But Bede was also a Christian exegete who thought deeply and earnestly about how salvation-history connected to natural history and the history of the peoples of the earth. To comprehend his religious mentality, we have to take on board his views on “science” —— and vice versa. On the Nature of Things is a survey of cosmology. Starting with Creation and the universe as a whole, Bede reads the cosmos downwards from the heavens, through the atmosphere, to the oceans and rivers of earth. This order (recapitulating the four elements or fire, air, water and earth) was derived from his main source, Isidore of Seville’s On the Nature of Things. However, Bede separated out Isidore’s chapters on time, and dealt with them in On Times. On Times, like its “second, revised and enlarged edition” The Reckoning of Time (De temporum ratione), works upwards from the smallest units of time, through the day and night, the week, month and year, to the world-ages. Bede’s innovation is to introduce a practical manual of Easter reckoning, or computus, into this survey. Hidden beneath the matter-of-fact surface of the work is an intense polemic about the correct principles for determining the date of Easter —— principles which in Bede’s view are bound up with both the integrity of nature as God’s creation, and the theological significance of Christ’s death and resurrection. 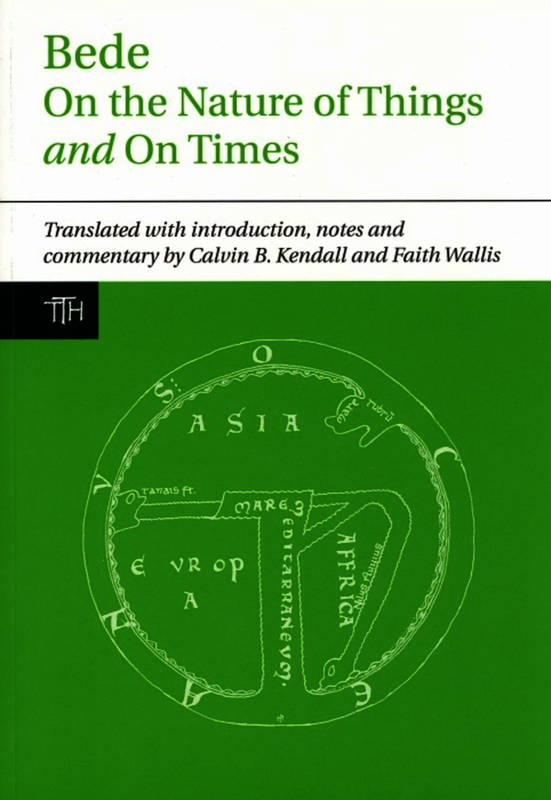 In these works Bede re-united cosmology and time-reckoning to form a unified science of computus that would become the framework for Carolingian and Scholastic basic scientific education. Accurate, elegant, utterly clear and easily accessible, even for readers who lack expertise in the relevant disciplines. The Commentaries and Appendices shed floods of light on Bede's mental processes and expertise, and will represent a very significant landmark in Bedan studies. The book, in short, will be a wonderful addition to the series of TTH. ... you will find much here that is new and interesting, to make this a valuable addition to your library. The volume meets the generally high standards of the series to which it belongs. The interlinear references to the page numbers of the Latin edition, that of Charles W. Jones from Corpus Christianorum Series Latina, cxxiii, are very helpful in works such as this (though on p. 109 the reference to /588/ in the Latin seems to have disappeared; it should appear just after the first semicolon in ch. 5). Much work has been expended on these seemingly slight texts and it is to be appreciated. The translation itself is extremely well produced: it stays close to the Latin yet employs the best in modern idioms; I could uncover no errors of any kind. Scholars of Bede and the early Middle Ages will read these works with great interest for the light they throw on the organization of Bede's thought and the larger trajectory of his biblical vision; historians of science, meanwhile, will enjoy having in so inviting a volume translations of two early medieval works that had a strong hold on understandings of chronology and cosmology up till modern times. This new translation promises to introduce a new generation of scholars to Bede and will hence reveal to them something about this fascinating time in the history of ideas. Calvin B. Kendall is Emeritus Professor of English, University of Minnesota. Faith Wallis is Associate Professor in the Department of History at McGill University, Montreal.